Kayla Foster OF HBO's 'The Deuce', caught my attention as she was on hand for the premiere of 'Creed II' at the AMC Loews Lincoln Square in New York yesterday evening(November 14th). 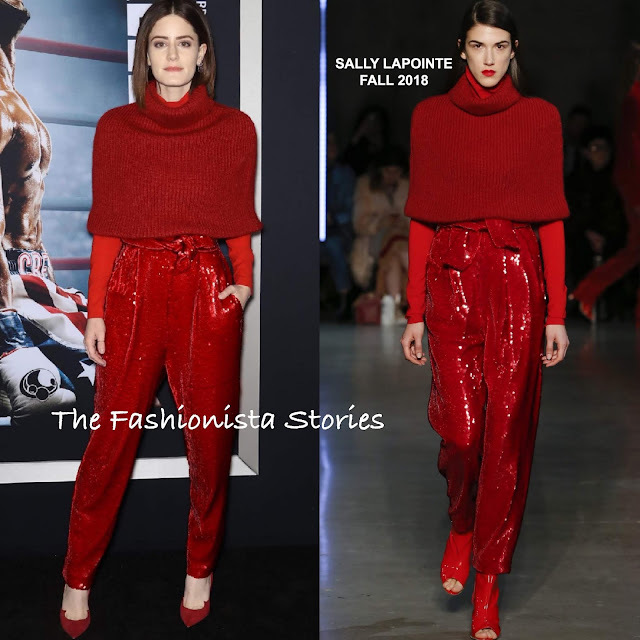 Kalya rocked a chic red ensemble from the SALLY LAPOINTE FALL 2018 collection, featuring a lightweight stretch silk ski top, which was layered with a cape turtleneck and paper-bag sequin tie waist trousers. Kayla red pumps by PAUL ANDREW where against her ensemble perfectly. Minimal makeup, straight off-the-shoulder tresses and silver earrings rounded out her look.